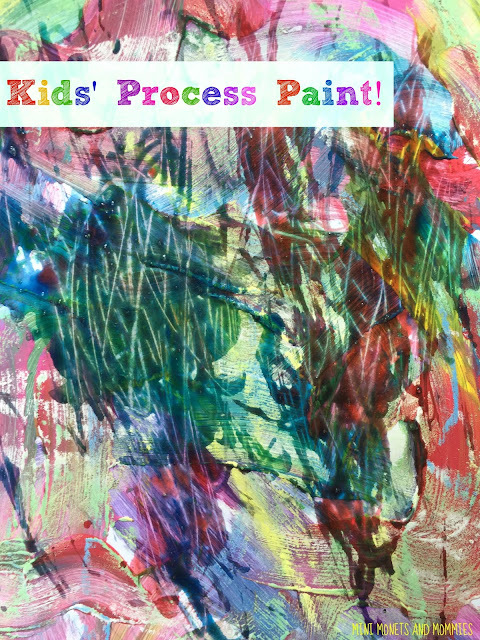 Mini Monets and Mommies: The Ever Evolving Kids' Art Activity: Paint It, Draw It and More! The Ever Evolving Kids' Art Activity: Paint It, Draw It and More! Who says that kids’ art activities have to be a one-time thing? For years I taught week-long summer art camps for children. One of my favorite parts of the five day programs was that we could start a project on Monday and keep on exploring it for four more days. Adding on to an art activity doesn’t just keep the kids busy, but it also gets them thinking about what they are making and what they can turn it into. It evolves and changes day-by-day, showing your child that one brush stroke, line made with a marker or glued on piece of paper doesn’t make or break the art. If your little artist is all about the color blue on Monday, she can paint it on. On Tuesday she may be feeling rather green or purple. She can add these hues too! Even though you’re about to see my version of this extended art activity, there’s no reason that your child needs to repeat it exactly as is. Create your own design, combining different materials and processes. Choose a theme for each day, a type of art-making or go with whatever your child is feeling. Keep in mind, you don’t need to set a specific date for finishing the art. You can quantify it and tell your child that she’s making a 3-day-long project or you can just let it go until it reaches its natural conclusion. You can also skip days if your child doesn’t have time or doesn’t feel like making art. · Paintbrush – Use different brushes in different thicknesses o with sponge tips. 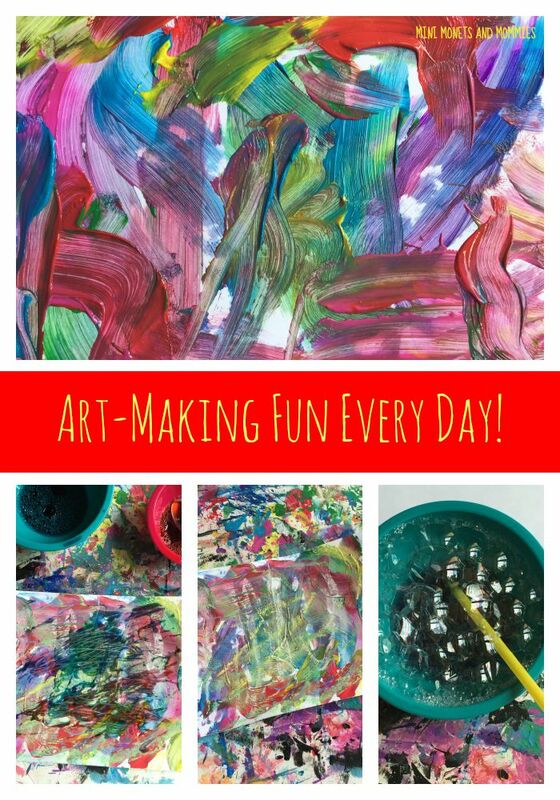 This extended kids’ art activity is a 3-day project. 1. Day 1-- Pour the paint onto a palette (I like to use wax paper or kitchen foil). 2. Cover the paper in different colors of paint. Encourage your child to mix the hues to make her own colors. 3. Let the paint dry overnight. 4. Day 2 – Explore making lines with the chalk. Have your child draw straight or curved lines over the paint. 5. Day 3 – Mix a batch of bubble paint. Add two to three drops of food coloring to one cup of dish soap and a tablespoon of water. As you mix it, the bubbles will grow. 6. Paint the colorful bubbles onto the paper. Use a brush (either the bristle part or the other end) to spread and ‘draw’ the click paint across the surface. What kinds of art process do you plan on including in your child’s extended creative activity? Tell us in the comments section. We often start projects one day and finish them later...waiting for glue and paint to dry before continuing with the next step. It helps to teach patience, too! Thank you for linking up with Mom's Library, I'm featuring you this week at Castle View Academy. Have a great summer of art!